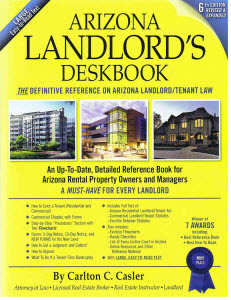 This is where you can get FREE information about Arizona landlord and tenant law (both residential and commercial). You will also learn about helpful products and services that are available for purchase. I have been a practicing Arizona landlord/tenant attorney since 1990 (24 years). I have drafted an Arizona lease form that has ALL 8 NOTICES required by Arizona law. Arizona has some very peculiar requirements for residential leases. All residential landlords in Arizona are required to give the tenant a specific form (in all cases) and two other forms (in some cases) AND requires that several very specific notices be given to the tenant BEFORE they sign the lease. NONE, and I mean NONE, of the "office supply" leases OR the "valid in all 50 states" leases contain all the required notices. But this one does AND IT IS FREE. It is a "basic" lease, but it satisfies all the legal requirements, comes with 12 PAGES OF INSTRUCTIONS, and is very "landlord friendly." If you want a few more "bells and whistles," then my $99 Arizona Rental Agreement/-Lease is available here. If you want the best possible Arizona Rental Agreement/Lease, that is VERY, VERY "landlord friendly," AND is drafted specifically for you and your properties, then you may want to learn more about my custom-drafted Arizona Residential Rental Agreement. The law requires the landlord to give the tenant a move-in inspection form at the beginning of the rental agreement (see A.R.S. 33-1321(C)). The form is for the tenant to document existing property damage/defects. That is all that is required by law, but that is grossly insufficient (in my view). As a landlord, you must look ahead to a court trial. How will you "document" the condition of the rental property before the tenant took possession of it, so that you can charge the tenant for property damage and/or excess wear and tear? What this question really means is: What evidence do I need in a court trial to recover for property damage and/or excessive wear and tear? First, you should have a "running list" of property defects for each rental property. Start the list on the day you acquire the rental unit or the first day you begin using the property as a rental. If that is not possible, then just start today. List the existing property defects. If you fix an item, update the list. If another defect arises, add it to the list. As time goes by, it will become a "running list" of defects and repairs for the rental unit. But this alone is still inadequate. Second, take a digital video of the exterior and interior of the rental unit BEFORE every tenant takes possession. If there are any existing property defects, take still photographs of those items. Third, take a digital video of the interior of the rental unit the FIRST TIME you enter the rental unit after the tenant has vacated. This could be: (1) the date the tenant gives you the key, (2) the date the constable gives you legal possession of the rental unit when s/he serves a Writ of Restitution (which can only be served after you have won a judgment in court against the tenant), or (3) after you have completed the abandonment process and retaken possession of the rental unit. As I said, take this video the very first time you enter the rental unit. Make it one continuous video of the inside. You should also take video of the exterior, which can either be a continuation of the video after you have finished the interior or can be a separate video that is taken before or after you take video of the interior. The reason for the taking the video the very first time you enter the rental property and for making it one, continuous video (not several short videos), is to reduce allegations that you caused the property damage after you recovered possession. Finally, you must take AT LEAST two still photographs of each item of property damage. For example, let's assume the living room has a hole (large or small) in the wall. For photograph one, stand as far away as you can, but be sure you can see the hole in the wall and, most importantly, that the photograph lets you, the tenant, and the judge know where you are in the house. For photograph two, get as close as you can and fill the view finder of the camera with the damage. If you only have photograph two and don't have photograph one, no one (including you) will be able to tell which room in the house sustained the damage or even if the damage is in your rental unit. So take AT LEAST two still photographs, but you can certainly take more if desired. You live in a digital world. It costs no more to take 50 digital photographs than it does to take 1 photograph. Also, Judges expect to see good, clear photographs from the landlord when the landlord is seeking to recover for property damage. Think ahead and make it easy for the judge to find in your favor by bringing in good evidence of the property BEFORE the tenant took possession and AFTER the tenant vacated. Legal answers: no, yes, and yes. Practical answers: yes, yes, and yes. The Arizona Landlord/Tenant Act (Act) says the landlord and tenant can agree to any terms they desire (see A.R.S. Section 33-1314), except for the impermissible provisions listed in A.R.S. Section 33-1315. Of all the terms landlords and tenants discuss and negotiate, clearly the amount of monthly rent is at the top of the list of negotiated terms. The agreed upon rental amount is, therefore, binding upon the landlord and the tenant and a trial court judge does not have the power to raise or lower the monthly rent. If the trial judge does raise or lower the rent, the aggrieved party has the right to appeal and they should prevail on appeal. That is the “legal” answer. As a practical matter, however, an appeal takes time and money and, therefore, the right of appeal is illusory for most litigants. Furthermore, the trial court judge who makes decisions that are contrary to law suffers no consequence, other than to discover months or years later that one of his/her decisions was overturned on appeal. As for late fees and attorney’s fees, the Act says late fees and attorney’s fees must be “reasonable.” (A.R.S. Section 33-1368). That becomes a “factual” finding by the trial judge and it is nearly impossible to overturn a trial judge’s decision to reduce (trial judges never raise) the amount of late fees and/or attorney’s fees. The landlord has three separate and distinct obligations regarding the move-out inspection. First, the landlord must give the tenant a move-in inspection form, which will document the condition of the rental property upon move-in and subsequently compared with the entries on the move-out inspection form when tenancy ends. If the landlord does not have a completed move-in inspection form, it is much harder to successfully charge a tenant for damages or additional cleaning. Finally, at the end of tenancy, the landlord must inform the tenant when the move-out inspection will occur. Again, this is direct from the statute, A.R.S. § 33-1312(C): "Upon request by the tenant, the landlord shall notify the tenant when the landlord's move-out inspection will occur.” However, the tenant must request to be present before the landlord is obligated to notify the tenant of the move-out inspection. And the landlord is merely required to notify the tenant of the date/time of the move-out inspection – the landlord IS NOT required to schedule the move-out inspection at a time that is convenient for the tenant (although the landlord may, if desired). The move-out inspection should be conducted during the landlord’s normal business hours. There are only three ways for a residential landlord to recover possession of the rental unit: (1) the tenant voluntarily returns possession of the rental unit to the landlord (i.e., at the end of tenancy or for any other reason), (2) by court order (i.e., after the landlord has filed and succeeded in an eviction action against the tenant) or (3) after abandonment of the rental unit by the tenant (as "abandonment" is defined under the Act). At no time may a residential landlord lock the tenant out of the rental unit while the tenant is “still occupying” the rental unit. Having said that, a landlord can change the locks: (1) after the court has issued a "Writ of Restitution" and the "Writ of Restitution" has been executed/served upon the tenant by the Sheriff or Constable, but that right is conferred upon the landlord by court order and, technically, the locks are being changed by the Sheriff or Constable and (2) after the landlord has followed and completed the abandonment procedure (see ARS Section 33-1370 for that procedure); changing the locks under these circumstances is permissible because the tenant is no longer “occupying” the rental unit. Normal wear and tear is the natural and gradual deterioration that occurs when the rental property is used as a residence. Normal wear and tear does not include excessive and/or abusive use, misuse, negligence, carelessness, accident, criminal damage, vandalism, or theft, whether caused by Tenant, Occupants, guests, invitees, third-parties and/or trespassers. Normal wear and tear does not include holes (pinholes, nail holes, or otherwise), gouges, scratches, stains, burns, and/or damage of any kind in the ceiling, walls, doors, floor coverings, and/or appliances. Feel free to use the foregoing language in your rental agreement. When a rental property is sold during the term of the lease, the new owner takes the property "subject to" (discussed more below) the existing lease. This is true of a normal sale and a “short sale” because a short sale is still a sale of the rental property; the only difference is that, in a short sale, the lender has agreed to accept less than the full amount due on the existing loan, which does not affect the tenant in any way. As stated, the new owner takes the property “subject to” the existing lease, which means the new owner steps into the shoes of the former owner and is bound by the existing lease. The new owner must allow the tenant to stay until the end of a fixed term lease, but if the lease always was or has converted to a month-to-month lease, then the new owner may terminate tenancy by giving the tenant a 30-Day Notice of Termination. Of course, there is an exception; if the lease included a provision that the lease would terminate upon sale of the rental property, then the tenancy would terminate as provided in the lease. Yes. Generally, the law permits people to enter into contracts, including commercial leases, upon whatever terms the landlord and tenant agree. Therefore, if you sign a commercial lease for a store in a shopping center, for example, that is written to favor only the landlord, then, yes, you have effectively forfeited all rights not expressly granted to the you, the tenant, by the lease agreement. The Arizona Residential Landlord and Tenant Act (the "ACT"), A.R.S. §§ 33-1301 to 33-1381, gives tenants many rights, but these statutes do not apply to "commercial" leases (i.e., rental of real property other than dwelling units). The Landlord and Tenant statutes that apply to commercial leases, A.R.S. §§ 33-301 to 33-381, give the tenant practically no rights. Presumably, the Arizona legislature felt that persons who rent dwelling units (i.e., apartments, homes, etc.) need more protection from landlords than persons who have the financial wherewithal to rent commercial real estate. An example will best illustrate the drastic distinction between residential leases and commercial leases. The ACT requires that the landlord give a delinquent tenant a Five-Day Notice to Pay or Quit before initiating an eviction action. A.R.S. § 33-1368(B). Further, a residential tenant has an absolute right to pay the total amount owed (i.e., past due rent, late fees, court costs and attorneys' fees) and force the landlord to accept reinstatement of the lease. A.R.S. § 33-1368(B). A commercial landlord, however, when rent is in arrears for five days, may, at the landlord's option, either re-enter and take possession (i.e., lock the tenant out) or "without formal demand" commence an eviction action. A.R.S. § 33-361(A). Further, once the commercial landlord has terminated the lease, the tenant cannot (unless the landlord consents) reinstate the lease, even if s/he pays all amounts due (i.e., past due rent, late fees, court costs, attorneys' fees). As you can see, the rights afforded to residential tenants by the ACT greatly exceed the rights afforded commercial tenants by the statutes. Moreover, one of the statutes in the ACT prohibits landlords from attempting to take away any of the tenant’s rights that are granted by the ACT; meaning, a residential landlord cannot even put provisions in the residential rental agreement (even if signed by both parties) that take away any of the tenant’s rights under the ACT. The only way, then, for the commercial tenant to obtain more rights is to have these rights written into the lease agreement (i.e., the landlord cannot re-take possession for any type of default without five-days prior written notice). Returning to the answer to the question: the solution to your problem is simple in theory, but sometimes difficult in practice. Read the "proposed" lease agreement very carefully and/or have your attorney review it. Note any changes that you would like made to the terms "offered" (remember, at this point, the terms contained in the lease agreement are merely the terms offered by the landlord). Ask the landlord to modify the lease to include the terms that you wish changed. The landlord may change all, some or none of the terms you desire. You will either ultimately come to an agreement with the landlord or not. If the vacancy factor for the type of property you are looking for is high, your chances of convincing the landlord to modify his/her offered terms is greater than when the occupancy factor is low. If the landlord simply will not budge, then look elsewhere for a location and terms that are acceptable. Again, your chances of finding alternate commercial space on terms you find acceptable are greater when the vacancy factor for the type of property you are looking for is high. Some specific concerns that you will have as a new store owner in a shopping center are: (1) does your lease include a non-compete clause, so that the landlord cannot rent space in the same shopping center to a tenant with a similar business, (2) does the lease obligate you to remain for the entire term of the lease even if the anchor tenant terminates or vacates (an anchor tenant is normally the largest tenant in the shopping center and typically draws most customers to the shopping center; for example Home Depot or a grocery store), and (3) are you required to be open for business certain hours of the day and certain days? Naturally, there may also be many other concerns specific to the type of business you are running and/or the type of property that you are leasing. Once you have signed the lease agreement, however, onerous or not, you are bound by the terms of the written lease agreement; there is no statutory rescission period (i.e., you do not have a few days to "think about it" and cancel the deal without penalty). Only in the most exceptional circumstances will a court of law intervene and rule that a particular term is "unconscionable" (i.e., unenforceable) under the law. Can a residential tenant terminate a lease if the tenant is the victim of a crime? Maybe. The Act, Section 33-1318, allows a tenant to terminate a lease -- without any financial penalty whatsoever -- if the tenant is a victim of domestic violence AND the tenant sends a written request to the landlord to be released from the lease within thirty days after the incident. The tenant must also provide the landlord with evidence of the incident. There is no other statute or case that allows a tenant to terminate a lease if the tenant is the victim of a crime when the crime IS NOT domestic violence. Do the same actions required for eviction of a tenant apply if the tenant is renting a room out of your own personal home? Yes, with one exception. The LL/T Act applies "to the rental of dwelling units." Your house is a dwelling unit and, therefore, the Act applies to you and your house, which means that all the requirements of the LL/T apply to any tenant renting a room. In the case of a person renting a room and having access to common areas (i.e., kitchen, bathroom, living room, etc. ), the LL/T Act refers to that tenant as a "roomer" (see ARS Sec. 33-1310(13): " 'Roomer' means a person occupying a dwelling unit that lacks a major bathroom or kitchen facility, in a structure where one or more major facilities are used in common by occupants of the dwelling unit and other dwelling units. Major facility in the case of a bathroom means toilet, or either a bath or shower, and in the case of a kitchen means refrigerator, stove or sink." The only distinction in the Act between a roomer and a tenant appears in ARS Sec. 33-1314(D): "Unless the rental agreement fixes a definite term, the tenancy shall be week-to-week in case of a roomer who pays weekly rent, and in all other cases month-to-month." There are no other distinctions. Therefore, you must treat the roomer as you would any other tenant, with the sole exception being that if the roomer pays rent weekly and you wish to terminate the roomer’s week-to-week tenancy, then you only have to give ten days notice (see ARS Section 33-1375(A)), rather than thirty days notice (see ARS Section 33-1375(B)).